Some information. I had an iphone 6. Bent it pretty good. Decided to get a prepaid at&t iphone se because that $150 price point is killer. I set the phone up as new. Connected to my apple account and redownloaded everything manually. When is started the system size was around a gig. When done loading my apps and adjusting my settings it was up to 9 gb and now it's all done it's around 6. On a 32 gb phone 6 gb is a big chunk! I backed up the phone. Did an erase all content as settings and restored from the backup. Same issue. 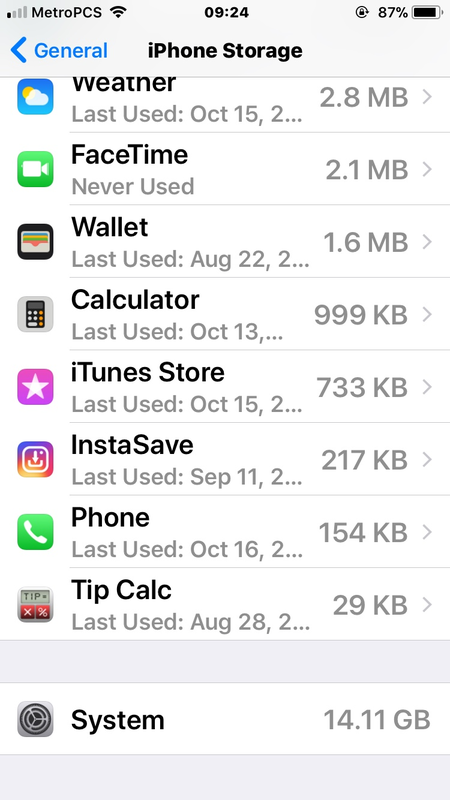 My iPhone 6 only had around 3 gb of system space. My wife's iphone 7 only has 300 mb of system. What gives? Check for downloaded iOS updates waiting to be installed. Excuse my ignorance. Where is that located? If i recall correctly it’s in Settings > General > Software Update. Otherwise it’s under iPhone Storage. Under the Software Update tab it just says that iOS 11.0.2 is up to date. Under Phone Storage there is nothing indicating a pending download other than the System size taking up so much space. Was your iPhone 6 on iOS 11? On iOS 9, the system took up 4.5 gb of storage space on a 32 gb model. There's been a lot added since then. You might contact Apple Support and see what they say. Last edited by Ledsteplin; 10-09-2017 at 01:13 PM. Yes my 6 was updated to 11.0.2 as well. I had them side by side. All system settings the same. Both running 11.0.2 one taking up 3 gb and one taking up 6 gb. Did a erase all content on both. Restored both from backups. 6 has 3gbs of system space, SE has 6 gbs. No clue. Maybe someone else knows. Or call Apple Support. Maybe they can explain why. Mine is huge, but doesn’t bother me. My iPod touch 6 has around 5.5 GB used for System,and it doesn't need all the phone stuff. 6 GB doesn't seem out of line. Forgive my ignorance...what exactly is the Takari? Do they use iPhones or Androids? Perhaps Windows Mobile, Symbian or Palm OS? The Takari is the name of my OnePlus 5. All my devices are named after Minbari ships from the TV show Babylon 5. Ah yeah! Haven't seen that show in ages. Great show. G'kar and Lando. Only got to see the first couple seasons.